I was in a plane ride yesterday and finally got the chance to write this draft. I know… quite late posting. But nevertheless, I would like to share this once a year long vacation and time spent with the family. We went all the way to Bulacan to spend Christmas Eve with my mom, siblings and brother-in law. We arrived just in time for lunch and had grilled stuffed bangus prepared by brother-in-law and mom’s fried chicken. Then for our dinner and Noche Buena, I cooked beef kaldereta, my sister made delicious chicken sopas and Gani prepared his favorite buko salad. After all the food preparation, we joined together for the evening anticipated mass in Ephesus chapel. This year, we made it different by dining out for lunch in a fast food restaurant in Malolos. Then, we went to each of our relatives’ homes nearby to greet them and deliver our gifts. It was a dessert day for me! I had haleyang ube, kakanin, sapin-sapin and different versions of fruit salad. For me, this is more relaxing than having all the preparations and entertaining guests done from home. Avelyn, my best friend since high school arrived from SG for a short vacation. 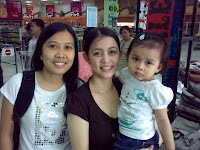 So we grabbed the chance to meet up and for her to see her lovely god-daugther. This was the day we went back to Manila. Along the way, we did our grocery shopping and had our lunch in Puregold E. Rodriguez. Upon arriving home, I felt so tired with all the chores we have to do since our Tita was on vacation until 1st week of January. Yes, we had to split this chore between me and my beloved Gani. ;-) I cannot handle the tons of dirty clothes we had so I made Reese clothes top priority! Gani went back to the office just for the day to finish some urgent task and to lessen his worries! Reese and I spent the whole day together. We’re back to the mall again to buy some stuff for the Media Noche and gift for an upcoming birthday party that Reese will be attending. We had family lunch with my in-laws and with Lola Deng. Then my mom visited us too and we brought her to Trinoma. I was able to buy boots for my upcoming travel to the US. Reese clothing was going to run out before the time that Tita will arrive, so I did some laundry this day. My mom was able to spend quality time with Reese, then she went home in the afternoon. 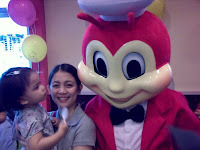 Agatha & Athena, twin daughters of Janice have celebrated their birthday at Jollibee, The Fort. It was Reese first time to experience this and she was so game to dance. As for me, I did like the place and same with Gani. We will surely go there again.